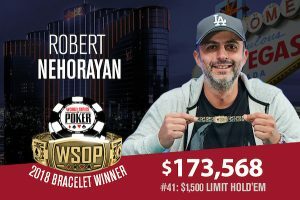 Robert Nehorayan is known by many as Rec Rob, his nickname derived from him identifying himself as a recreational player. However, he outlasted last night a field that included seasoned poker pros like Daniel Negreanu, Chris Ferguson, and Ari Engel to win his first gold bracelet from the WSOP and his largest cash of $173,568. The player topped the 596-strong field of Event #41: $1,500 Limit Hold’em. 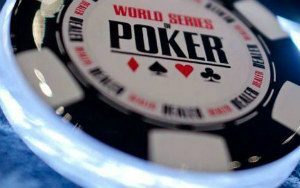 As mentioned above, some of poker’s top players entered the tournament to pursue another great accomplishment in the game. Of all fellow participants, Nehorayan had special praise for Terricita Gutierrez, a Limit Hold’em specialist whom the eventual champ considered his toughest opponent. Terri, as Nehorayan called her, has been playing Limit Hold’em cash games every single day for years now to accumulate knowledge and experience that many other fellow players at the table lacked. She was ultimately eliminated in fourth place, good for $51,733. The $1,500 event was played over three days through June 22. It saw 596 entries generate a prize pool of a little over $800,000. The top 90 places paid. Day 3 of the tournament kicked off with 19 survivors in contention but seven of them quickly headed to the payout desk within the first 90 minutes of play. Action slowed up a bit afterward, as finalists became more aware of the event’s approaching end. Chips swung back and forth throughout the day and the chip lead went from one player to another. Many of the remaining hopefuls had many ups and downs, but it can be said that Nehorayan managed to maintain a good stack and momentum throughout that final stage of the event. The brand new WSOP champion admitted that he had really good cards running his way, as well. David Gee was the last player to be eliminated before the heads-up duel. That final duel took place between Nehorayan and one-time gold bracelet winner Kevin Song. Song won his piece 21 years ago for topping the field of a Limit Hold’em event. A second piece eluded him last night, unfortunately, although he fought really fiercely for it. The match between the final two men standing began with Nehorayan holding a 3-1 advantage to Song. However, the latter quickly caught up and took the lead for a little while, putting great pressure on his opponent. Nehorayan eventually regained his momentum and retook the chip lead to never look back. On Hand #286 of the final table, the player won a key pot that secured him with 3.9 million, while leaving Song with just 475,000. The final hand of the tournament was dealt shortly after. On Hand #289, Nehorayan called from the button and Song raised. Nehorayan asked his opponent how much he had left and put him all in. Song tabled [8s][6s] to clash into Nehorayan’s [10s][7d]. The board landed [2c][Qh][9h][4h][Jh] to end Song’s participation in the tournament and seal the victory for Nehorayan.